Success in racing horses lies in the ability of your trainer. In the first place, the trainer needs the special skill to be able to select potential winners from the myriad of unraced yearlings that are offered every year. Then he has to have the ability to educate and condition the equine athlete to be capable of competing at the peak of the horse’s natural ability. Understanding this, there is no one better than Neville Parnham. 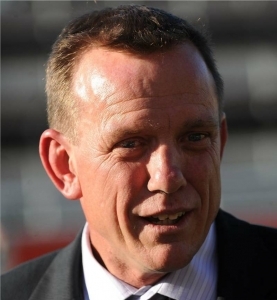 Neville is the current WA Champion trainer. He has won 12 training premierships, including the last 11 in a row. He was born into racing with his Father and Uncle being successful trainers. He started out as a jockey but weight forced him to hang up the boots and join the training ranks. We guess you could say he has been doing his training apprenticeship since he could walk. When we went looking for our lead trainer we went no further than looking at top of the Ladder. You don’t win eight training premierships without having that special touch. What we like about Neville is his ability to consistently get winners from his babies through to older horses. Neville places his horses to earn prize money. Neville’s training facilities are first class. He has stables in the heart of Ascot as well as a rural complex in Banjup allowing him to place a horse in the most suitable environment for that that particular horse. In our quest to race horses capable of being successful in metropolitan racing, we believe the Neville Parnham factor improves our odds of success. Fred Kersley is simply known as “the master horseman”. As journalist Danny Power writes “Although thoroughbred racing and harness racing both involve horses, rarely has a trainer become a household name in each industry. Fred’s stellar performance as thoroughbred trainer since switching codes has no equal in Australia. Without doubt, you would be hard-pressed recall a trainer that has had such an impact in such a short time since joining the WA training ranks. Simon learnt his trade from several of the best in the business. As a teenager he worked for Charlie Goggin. He then went on to leading Cranbourne trainer Robbie Griffiths where he spent six years honing his craft. Simon was then offered the assistant trainer position with one of Australia’s top trainers John O’Shea. From there he was given the opportunity to train in his own right in Perth for Aquanita Racing. Before moving to Perth, he spent six months under the guidance of Aquanita trainers Tony Vasil and Robert Smerdon. Jarrod Austin and his Warwick Farm team have a hands on approach, with the philosophy that in order to realise each horse’s best potential, it should be happy, healthy and fighting fit. They receive highly individual and specialised care which, combined with patience and hard work, make up the key ingredients of Austin Racing’s successful formula. Jarrod’s life long experience in the racing and thoroughbred industry was rewarded with immediate success. Established in 2011, Austin Racing achieved a city metropolitan double – which included a Listed win – in its first season, along with numerous city winners from a small base of horses. With his band of loyal owners and new clients entrusting their horses to his care, Austin Racing will continue to climb the ladder of racing success.